This is a delicious recipe. It was taken from a book my friend gave me for my birthday earlier this year called the Big Book of Baking. I like baking something different and saw this one and thought yep I am going to try it. I have never used coconut cream before and the pineapple jam sounded irresistible. I looked everywhere but could not find the jam but did find a Passionfruit Pineapple Jam from IXL at Woolworths. I picked out as many passionfruit seeds as I could and it turned out a treat. Also the recipe called for two 20cm tins but I only have one so used one and just cut it in half. It still worked out incredibly well. The measurements are also in grams not cups which makes it a bit tricky, I didn't want to write on my book and forgot to write out the measurements separately so you will need your electronic scale for this one. Grease and line a 20 cm round cake tin. Place 175 gm margarine in a mixing bowl with caster sugar. And eggs and sift in the flour, baking powder and cinnamon. Beat together until smooth, then stir in the desiccated coconut and 2 tablespoons of the coconut cream. Pour mixture in the tin and smooth the top. Bake in the preheated oven for 25 minutes or until golden and firm to the touch. Leave to cool in the tin for 5 minutes, then turn onto a wire cooling rack, peel off the lining paper and leave to cool completely. Sift the icing sugar into a bowl and add the remaining butter and coconut cream. Beat together until smooth. 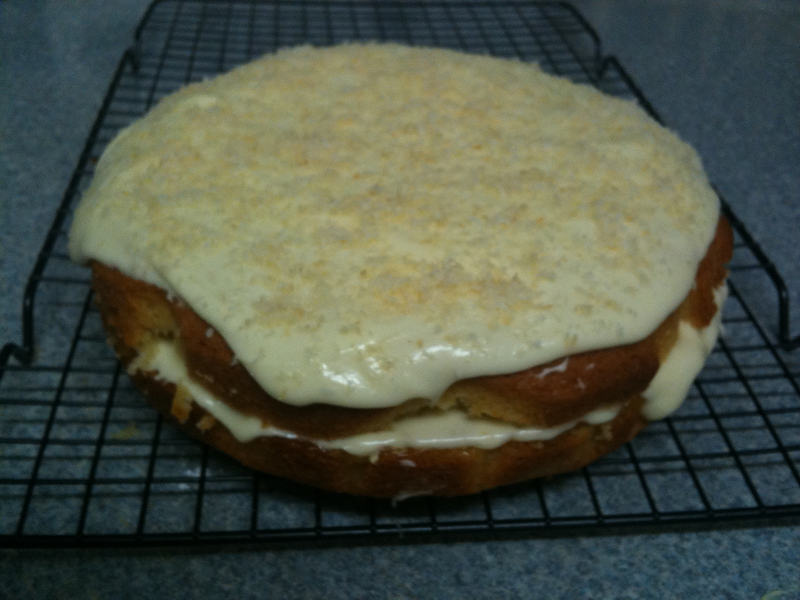 Cut the cake in half and spread the pineapple jam inside and top with just under half the cream. Place the other half of the cream on top of the cake and scatter with toasted desiccated coconut.